Have you ever heard of the saying, believe what you see? This saying basically says that if you do not see it with your own eyes, you shouldn’t believe it. Faith says the complete opposite of this saying, faith says believe what you do not see. Faith says to believe in the promises of God. This year a horrible Hurricane swept through Houston, Texas called Hurricane Harvey. Following the Hurricane God put it on my heart to plan a book drive with my friend, Klarke. Prior to hosting the book drive we didn’t have place to host it or even shelters to donate to. We called places and we kept getting “no.” Many shelters even told us that they weren’t accepting any donations from small businesses, only large companies. We planned to host the book drive anyway. 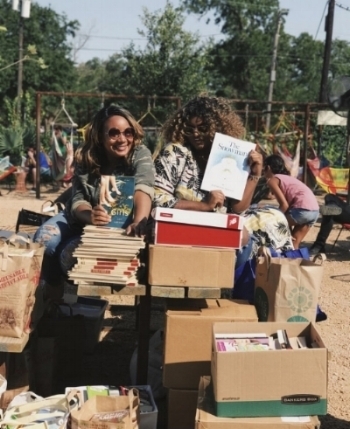 A week before hosting, a place here in Houston allowed us to host of book drive at their establishment.We were so excited. We set a goal to raise 1,000 books. We shared out drive on Facebook, Twitter, and Instagram. We still didn’t know where we would even donate books, but we planned anyway. The day of the book drive we received over 4,000 books. Families all over the country and in authors in other states were trying to send us books to donate. The support we received was amazing. There were so many books that it took about 7 cars and multiple trips to get the books to our homes. After the book drive I continued to call shelters, they continued to tell us no. Yet, we still planned for the impossible. We really wanted to donate to NRG. NRG directed us to the organization running the shelter there called Baker Ripley. I noticed Baker Ripley’s Vice President was the former Mayor of Houston, Annise Parker. I went to school with Annise Parker’s daughter and I was able to contact her daughter. She then connected us with Annise Parker. Annise Parker gave Klarke and I the permission to donate the books to NRG. It all worked out!It all worked out because even though we couldn’t see the end results, we planned for the impossible. The example Christ set for us, is the example we followed. With our faith, we were able to see the vision come to pass.Overthinking can be overcame. We have to give God the ultimate control, take advantage of our resources, and plan for the impossible.